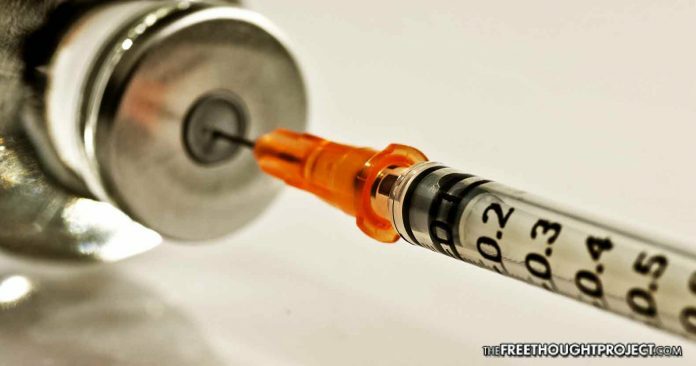 While we have everyone from attorneys to biologists, to political scientists who write for the Free Thought Project, none of us are doctors, so we do not make recommendations about what you and your family should do in regards to vaccination. It is important to note, however, that everyone deserves the right to make informed decisions on their own personal health and the health of their children. Recently, the Physicians for Informed Consent (PIC) reported in the British Medical Journal that every year, approximately 5,700 U.S. children suffer from seizures as a direct result of the measles, mumps, and rubella (MMR) vaccine. According to PIC, this finding is derived from results of the most statistically powered safety study ever to measure the association between MMR vaccination and febrile seizures. More than half a million children were evaluated, both vaccinated and unvaccinated, from a Danish population that is relied upon globally to examine vaccine safety. The results showed that seizures from the MMR vaccine occur in about 1 in 640 children up to two weeks following MMR vaccination. Applying this risk of seizures to the 3.64 million U.S. children vaccinated with a first dose of MMR every year results in about 5,700 annual MMR-vaccine seizures. What’s more, the seizures from the MMR vaccine are far worse, according to the study and can cause permanent harm. PIC notes that the government reporting system for vaccine injuries, Vaccine Adverse Event Reporting System (VAERS), receives only fraction of the those reported seizures from the MMR vaccination. According to PIC, this could mean that there is an underreporting of other serious vaccine adverse events from MMR, including permanent neurological harm and death. According to the report, the measles vaccine was introduced in the U.S. in 1963 and is now only available as a component of the measles, mumps, and rubella (MMR) vaccine. It has significantly reduced the incidence of measles; however, the vaccine is not capable of preventing all cases of measles, as failures have been reported. The manufacturer’s package insert contains information about vaccine ingredients, adverse reactions, and vaccine evaluations. For example, “M-M-R II vaccine has not been evaluated for carcinogenic or mutagenic potential, or potential to impair fertility.” Furthermore, the risk of permanent injury and death from the MMR vaccine has not been proven to be less than that of measles.